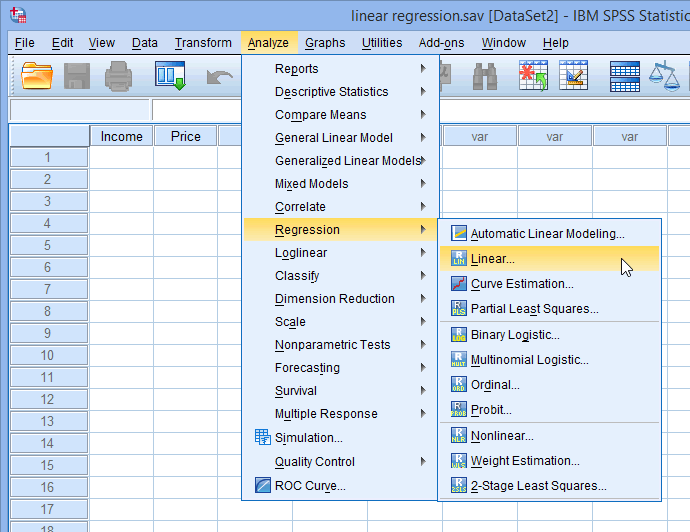 Linear Regression Analysis in SPSS Statistics - Procedure, assumptions and reporting the output. Linear regression is the next step up after correlation. It is used when we want to predict the value of a variable based on the value of another variable. The variable we want to predict is called the dependent variable (or sometimes, the outcome variable). The variable we are using to predict the other variable's value is called the independent variable (or sometimes, the predictor variable). For example, you could use linear regression to understand whether exam performance can be predicted based on revision time; whether cigarette consumption can be predicted based on smoking duration; and so forth. If you have two or more independent variables, rather than just one, you need to use multiple regression. This "quick start" guide shows you how to carry out linear regression using SPSS Statistics, as well as interpret and report the results from this test. However, before we introduce you to this procedure, you need to understand the different assumptions that your data must meet in order for linear regression to give you a valid result. We discuss these assumptions next. When you choose to analyse your data using linear regression, part of the process involves checking to make sure that the data you want to analyse can actually be analysed using linear regression. You need to do this because it is only appropriate to use linear regression if your data "passes" six assumptions that are required for linear regression to give you a valid result. In practice, checking for these six assumptions just adds a little bit more time to your analysis, requiring you to click a few more buttons in SPSS Statistics when performing your analysis, as well as think a little bit more about your data, but it is not a difficult task. Assumption #1: Your two variables should be measured at the continuous level (i.e., they are either interval or ratio variables). Examples of continuous variables include revision time (measured in hours), intelligence (measured using IQ score), exam performance (measured from 0 to 100), weight (measured in kg), and so forth. You can learn more about interval and ratio variables in our article: Types of Variable. If the relationship displayed in your scatterplot is not linear, you will have to either run a non-linear regression analysis, perform a polynomial regression or "transform" your data, which you can do using SPSS Statistics. In our enhanced guides, we show you how to: (a) create a scatterplot to check for linearity when carrying out linear regression using SPSS Statistics; (b) interpret different scatterplot results; and (c) transform your data using SPSS Statistics if there is not a linear relationship between your two variables. 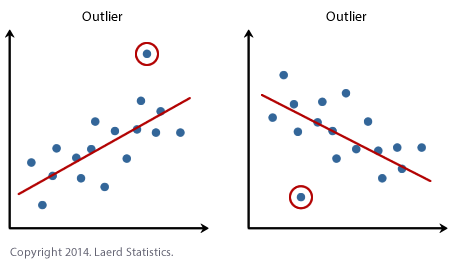 The problem with outliers is that they can have a negative effect on the regression analysis (e.g., reduce the fit of the regression equation) that is used to predict the value of the dependent (outcome) variable based on the independent (predictor) variable. This will change the output that SPSS Statistics produces and reduce the predictive accuracy of your results. Fortunately, when using SPSS Statistics to run a linear regression on your data, you can easily include criteria to help you detect possible outliers. In our enhanced linear regression guide, we: (a) show you how to detect outliers using "casewise diagnostics", which is a simple process when using SPSS Statistics; and (b) discuss some of the options you have in order to deal with outliers. Assumption #4: You should have independence of observations, which you can easily check using the Durbin-Watson statistic, which is a simple test to run using SPSS Statistics. We explain how to interpret the result of the Durbin-Watson statistic in our enhanced linear regression guide. Whilst these help to illustrate the differences in data that meets or violates the assumption of homoscedasticity, real-world data can be a lot more messy and illustrate different patterns of heteroscedasticity. Therefore, in our enhanced linear regression guide, we explain: (a) some of the things you will need to consider when interpreting your data; and (b) possible ways to continue with your analysis if your data fails to meet this assumption. Assumption #6: Finally, you need to check that the residuals (errors) of the regression line are approximately normally distributed (we explain these terms in our enhanced linear regression guide). Two common methods to check this assumption include using either a histogram (with a superimposed normal curve) or a Normal P-P Plot. Again, in our enhanced linear regression guide, we: (a) show you how to check this assumption using SPSS Statistics, whether you use a histogram (with superimposed normal curve) or Normal P-P Plot; (b) explain how to interpret these diagrams; and (c) provide a possible solution if your data fails to meet this assumption. You can check assumptions #2, #3, #4, #5 and #6 using SPSS Statistics. Assumptions #2 should be checked first, before moving onto assumptions #3, #4, #5 and #6. We suggest testing the assumptions in this order because assumptions #3, #4, #5 and #6 require you to run the linear regression procedure in SPSS Statistics first, so it is easier to deal with these after checking assumption #2. Just remember that if you do not run the statistical tests on these assumptions correctly, the results you get when running a linear regression might not be valid. This is why we dedicate a number of sections of our enhanced linear regression guide to help you get this right. You can find out more about our enhanced content as a whole here, or more specifically, learn how we help with testing assumptions here. In the section, Procedure, we illustrate the SPSS Statistics procedure to perform a linear regression assuming that no assumptions have been violated. First, we introduce the example that is used in this guide. A salesperson for a large car brand wants to determine whether there is a relationship between an individual's income and the price they pay for a car. As such, the individual's "income" is the independent variable and the "price" they pay for a car is the dependent variable. The salesperson wants to use this information to determine which cars to offer potential customers in new areas where average income is known. In SPSS Statistics, we created two variables so that we could enter our data: Income (the independent variable), and Price (the dependent variable). It can also be useful to create a third variable, caseno, to act as a chronological case number. This third variable is used to make it easy for you to eliminate cases (e.g., significant outliers) that you have identified when checking for assumptions. However, we do not include it in the SPSS Statistics procedure that follows because we assume that you have already checked these assumptions. 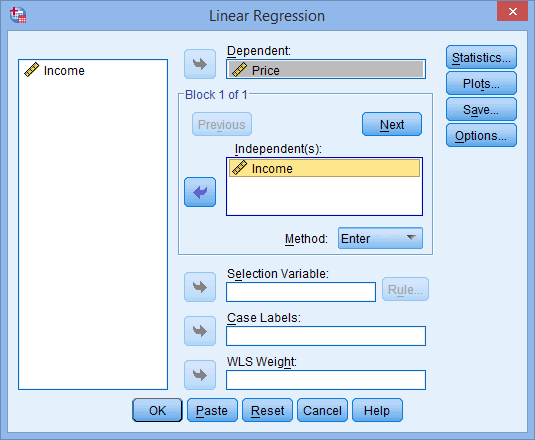 In our enhanced linear regression guide, we show you how to correctly enter data in SPSS Statistics to run a linear regression when you are also checking for assumptions. You can learn about our enhanced data setup content here. Alternately, we have a generic, "quick start" guide to show you how to enter data into SPSS Statistics, available here. The five steps below show you how to analyse your data using linear regression in SPSS Statistics when none of the six assumptions in the previous section, Assumptions, have been violated. At the end of these four steps, we show you how to interpret the results from your linear regression. If you are looking for help to make sure your data meets assumptions #2, #3, #4, #5 and #6, which are required when using linear regression and can be tested using SPSS Statistics, you can learn more in our enhanced guide here. Published with written permission from SPSS Statistics, IBM Corporation. You now need to check four of the assumptions discussed in the Assumptions section above: no significant outliers (assumption #3); independence of observations (assumption #4); homoscedasticity (assumption #5); and normal distribution of errors/residuals (assumptions #6). You can do this by using the and features, and then selecting the appropriate options within these two dialogue boxes. In our enhanced linear regression guide, we show you which options to select in order to test whether your data meets these four assumptions. Click the button. This will generate the results. SPSS Statistics will generate quite a few tables of output for a linear regression. In this section, we show you only the three main tables required to understand your results from the linear regression procedure, assuming that no assumptions have been violated. A complete explanation of the output you have to interpret when checking your data for the six assumptions required to carry out linear regression is provided in our enhanced guide. This includes relevant scatterplots, histogram (with superimposed normal curve), Normal P-P Plot, casewise diagnostics and the Durbin-Watson statistic. Below, we focus on the results for the linear regression analysis only. This table provides the R and R2 values. The R value represents the simple correlation and is 0.873 (the "R" Column), which indicates a high degree of correlation. The R2 value (the "R Square" column) indicates how much of the total variation in the dependent variable, Price, can be explained by the independent variable, Income. In this case, 76.2% can be explained, which is very large. This table indicates that the regression model predicts the dependent variable significantly well. How do we know this? Look at the "Regression" row and go to the "Sig." column. This indicates the statistical significance of the regression model that was run. Here, p < 0.0005, which is less than 0.05, and indicates that, overall, the regression model statistically significantly predicts the outcome variable (i.e., it is a good fit for the data). 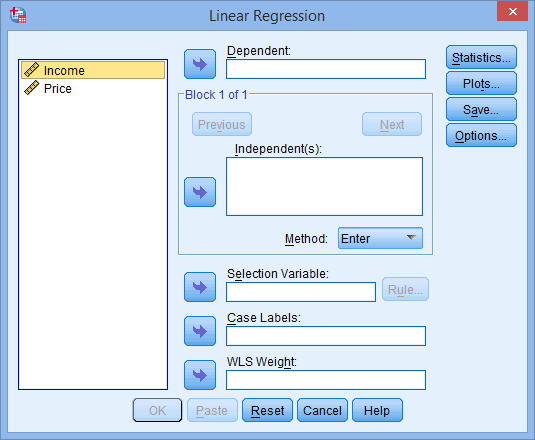 If you are unsure how to interpret regression equations or how to use them to make predictions, we discuss this in our enhanced linear regression guide. We also show you how to write up the results from your assumptions tests and linear regression output if you need to report this in a dissertation/thesis, assignment or research report. We do this using the Harvard and APA styles. You can learn more about our enhanced content here. We also have a "quick start" guide on how to perform a linear regression analysis in Stata here.